Renovating our beloved 111 yr old house, again. This time, the dining room. Room by room we have made this house our home. For 22 years we have lived with no insulation in this room. So out comes the old painted-over panelling, the 50‘s wallpaper, the lathe and plaster underneath, the 1960’s ceiling tiles and old window. The panelling wasn’t tall enough for this beautifully high ceiling. So the former owners had put a little line of board to cover up the seam. Twenty years ago I painted blue over that dark panelling which had been so 60’s vogue. Just after we moved here I found this old Irish hearth poem while visiting the home museum of Frank Lloyd Wright in Oak Park, IL. It appealed to me so much I painted it on our dining room walls and stenciled flowers and a rope design to cover up the panelling job. The length of each stanza fit so beautifully on each wall and it reflected our family values. The blessing of the house is contentment. The stenciling had been a labour of love. I photocopied a favourite font in magnification, cut each letter into mylar and then the tedious job of measuring it all out and painting. I often wondered what dinner guests thought of this stenciling on our walls. This week when we started the reno job it really struck me that if you asked me to quote this poem for memory I couldn’t do it. Familiarity with your surroundings. Now that we are ripping it down I’m going to miss it. I suppose I could paint it again once the new drywall is finished. But that’s not something I desire to do. Our home has it’s own voice. 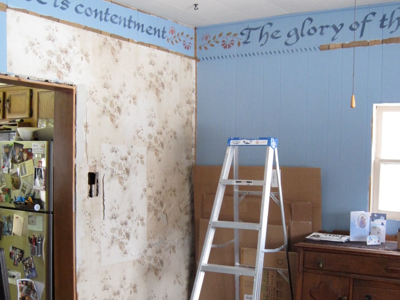 This entry was posted in News and tagged house, poem, renovating on December 30, 2010 by nurturingspace.